Broadcast from the Reif Performing Arts Center, Grand Rapids,MN. On June 29, 2013, the Great Northern Radio Show made its first appearance in the hometown of Northern Community Radio, Grand Rapids, Minnesota. Not only that, we filled the Reif Center for the Performing Arts in one of the most exciting shows of the season. 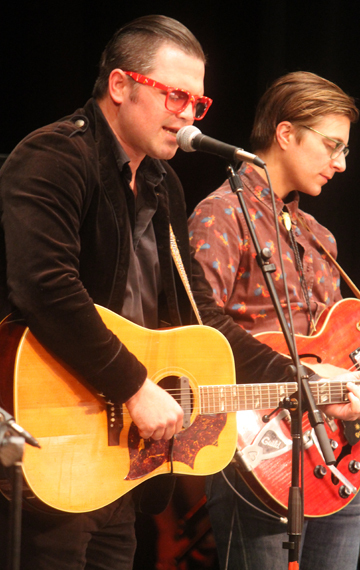 It was a stacked musical lineup, including Actual Wolf, the Roe Family Singers, Sam Miltich and Mary LaPlant, the acoustic trio In Theory and Nickolai Koivunen on house keyboards. The Great Northern Radio Players in this episode included Bill Adamson, Jim Cagle, David Martin, Sharon Marty, Katie Smith, Bill Lah, Cory Kolodji, and Scott Hanson on foley sound. Our adventures took us on a time traveling steamboat that detailed area history and the growing threat of “muscle zebras,” a particularly troublesome invasive species. We visited Oz long after Dorothy left, to meet a Munchkin running the local chamber of commerce. We went inside the den of a local famous internet bear for her television broadcast. One of the highlights was a musical number featuring an Iron Range miner (Bill Lah) and a Grand Rapids paper worker (Cory Kolodji) singing about the rivalry between Rapids and the Range. Special guests included naturalist and Northern Community Radio star John Latimer and “The Simple Guys,” Jim Cagle and Bill Adamson. The show featured monologues from Steve Downing and Chris Quaal Vinson. All that and new audio essays about Modern Life in Northern Minnesota by producer, writer and host Aaron Brown. This June 29, 2013 program aired live on 91.7 FM KAXE Grand Rapids, Aitkin and the Iron Range, 90.5 KBXE Bagley and Bemidji, 89.9 Brainerd and 103.9 in Ely. The show was also rebroadcast on independent public radio stations throughout Minnesota and distributed as a live stream and podcast. The Great Northern Radio Show is made possible by the Minnesota Arts and Cultural Heritage Fund with support from the Iron Range Resources and Rehabilitation Culture and Tourism grant program and the Blandin Foundation.